For part 1 of the series, click here. The Internet of Things (IoT) will be a fundamental shift from the current economy, leading some to even claim that IoT will bring about “the next industrial revolution.” Telcos seem to be a position to capitalize on this (all that data has to use a network), but they need to invest and develop new strategies and infrastructure to meet the demands of the IoT age. We discussed this topic in great length in July when we teamed with Beecham Research and VanillaPlus for our webinar, “Surviving IoT: How Telcos Can Thrive in the Next Industrial Revolution”. With an engaged audience, we fielded a number of different questions throughout the webinar, which you can read about in part 1 of this blog series or listen to the webinar recording. However, due to time constraints, there were a few questions that remained unanswered. This blog aims to delve into some of those additional questions and provide further clarity into the opportunities surrounding the IoT for telcos. A: While some may argue that the best solution is to just throw away all of your investments and start over, the real answer is that existing infrastructures can be utilized for the IoT. Virtualization with a hybrid model (where physical hardware coexists with VNFs) will enable the necessary scaling to deal with IoT levels of traffic, while utilizing existing hardware. Of course, that isn’t to say that new investments are entirely unnecessary. For instance, some telcos are wondering if investing in technologies such as Hadoop will be enough. While those investments are good ideas, telcos will need to invest in service-driven architectures in order to truly thrive in the age of IoT. A: While infrastructure is one component of an IoT strategy, services will become a larger portion of a telco’s business. OTT providers provide traditional telco services (like texting), and IoT communications will be large in volume, but low in actual customers. A company that just “provides the pipes” will struggle in the age of IoT. The biggest obstacle for “traditional telcos” is going to be a lack of end application innovation. And while acquisitions of existing services will help, telcos can not just buy their way out of the problem. They will have to innovate and provide purpose-built solutions that are built in-house. A: As with most technologies, open source is a natural place to look for solutions. With IoT, open source will remain and will drive some innovation and competition. However, purpose-built software vendors will always provide higher value and more stability than open source, as well as enable the next level of innovation. The IoT presents exciting new business opportunities for telcos – especially in an era where traditional revenue streams are being eroded by the growing influence of OTT providers. But in order to win in the IoT, telcos must innovate and reinvent themselves. Failure to do so will result in losses and missed opportunities. 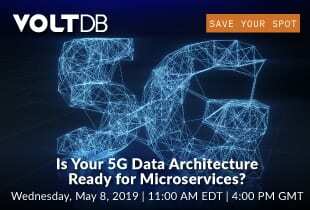 Find out how VoltDB works to help telcos modernize their applications and how we play in the IoT space today – and be sure to share your own thoughts in the comments section below.